All students being dropped off by car can arrive to school no earlier than 8:45 am. 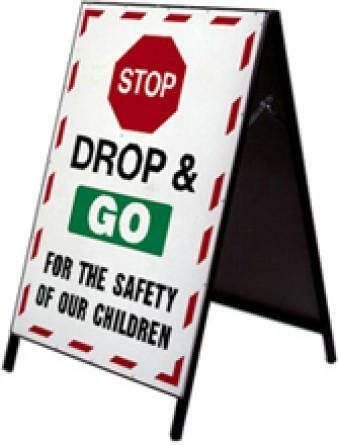 When dropping off through the loop, please follow the signs to pull forward all the way before dropping off your child. Please practice with your child to independently buckle and unbuckle in order to get out of the car. We have a staff supervising drop off beginning at the 8:45 am time and will assist your child in getting into school. If you choose to walk your child in, please park in the lot or on Game Farm Road. DO NOT park in the loop. If you walk your child in, please say your good byes in the vestibule waiting area. After this week we want all students to walk to their classroom with their friends and school staff. All families should have a name plate with their student's name on it. Please display the name plate in your car window or show the school staff the card. All students will be called out one at a time. Please continue to pull forward by following the signs. Please practice with your child to independently buckle and unbuckle in order to get in the car. We ask that all students load their vehicle curb side as other cars pull out behind other cars. We only allow students to load their vehicles between the two signed areas. Please DO NOT wave your child to your car if you are not between those areas. Just a reminder Fridays are the most congested day of pick up, please be very patient as we want to keep our students safe. Overall, our drop off and pick up line runs pretty smoothly. Our families are what it makes it run the best! We know you love your kiddos, but save your long hellos and good byes for your driveway, not the school driveway. This year marks Hilltop Primary School’s 40th year of visiting Wolf Ridge Environmental Learning Center. To commemorate this significant milestone, Hilltop Wolf Ridge program directors Craig and Theresa Schmidt have set up a GoFundMe page to raise funds to purchase a special gift item to donate to Wolf Ridge in Hilltop’s honor. The Fifth Annual Westonka 5K FUNd Run will be held Saturday, May 18. This fun community event raises funds for Mound Westonka High School, Grandview Middle School and Shirley Hills and Hilltop primary schools. Be a part of this year’s success by becoming a sponsor. Students throughout the Westonka School District took part in the annual "Stuff the Bus" event March 8 to benefit the Westonka Food Shelf. The effort involved all schools, each of which used creative ways of encouraging donations of cash, food and other needed items for the food shelf. The results were amazing, as students stuffed the bus with over 11,200 pounds of food and over $6,000 in donations. The Art Educators of Minnesota's Youth Art Month exhibition reception was held March 9 at the Minnesota State Capitol. Four Westonka students were presented with awards, including Hilltop Primary School fourth-grader Darren Croutseng, first-place in the elementary division; Hilltop third-grader Brynn Hiivala, second-place in the elementary division; Grandview Middle School seventh-grader Logan Henslin, first-place in the middle school division; and Mound Westonka High School senior Nick Drilling, honorable mention in the high school level.